The critically acclaimed, award-winning Elephant Theatre Company will begin its 14th season with the world premiere of Supernova by Timothy McNeil, with performances beginning on Thursday, May 20. Opening night is set for Saturday, May 22, and Supernova will play a limited engagement through June 27. 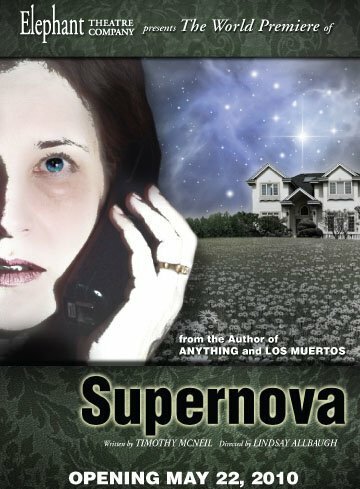 Supernova tells the story of Mabel Davies, a not-so-simple housewife in Des Moines, Iowa, who has spent years living for everyone else. Following the appearance of a magazine with a dog-eared page on her kitchen table, and the events that follow, Mabel finds her life changing in extraordinary ways. A ‘supernova’ is defined as an extremely luminous stellar explosion that briefly outshines an entire galaxy before fading from view. Supernova ponders fate, destiny, love, and radicalism. The cast will feature (in alphabetical order) Micah Cohen, Kelly Elizabeth, Gina Garrison, Tony Gatto, Bonnie McNeil, Tim McNeil, James Pippi, Edward Tournier, and Joe Wiebe. The design team for Supernova includes Elephant Stageworks (set), Joel Daavid (lighting), Jack Arky (sound) and Louis Douglas Jacobs (costumes). Edgar Landa is fight choreographer, Shannon Simonds is the production stage manager, and Supernova is being produced for the Elephant by David Fofi. 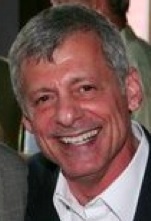 Playwright Timothy McNeil is a member of the Stella Adler Academy faculty, and his play Anything had its world premiere at the Elephant in 2008. 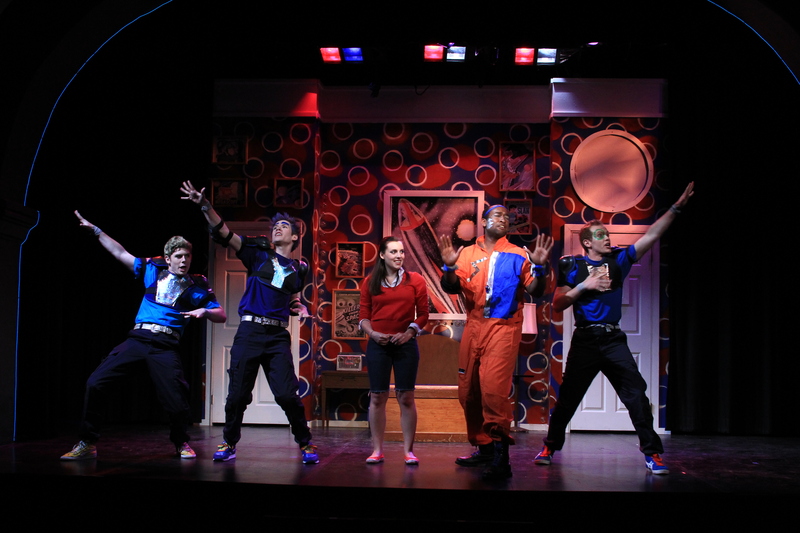 That production received four LADCC Award nominations, winning three, and was also nominated by GLAAD as best production of the year. Three of McNeil’s other plays have been produced locally: Los Muertos, Margaret, and Crane, Mississippi. There will be two lower-priced preview performances of Supernova on Thursday, May 20 and Friday, May 21 at 8pm, and opening night is set for Saturday, May 22 at 8:00. THE MEDIA IS INVITED AND ENCOURAGED TO ATTEND THE OPENING NIGHT PERFORMANCE ON SATURDAY 5/22, BUT IS ALSO WELCOME AT ANY OTHER PERFORMANCE AFTER THAT DATE. The regular performance schedule is Friday and Saturday at 8pm and Sunday at 7pm through June 27. All tickets for regular performances are $20 (previews are $15). To purchase tickets, call (323) 960-4410 or reserve online: www.plays411.com/supernova. 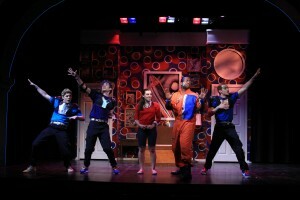 For more information on the Elephant Theatre Company, visit www.elephanttheatrecompany.com. The Elephant Space is located at 6322 Santa Monica Boulevard, just west of Vine, in Hollywood. Street parking is available. Rehearsals are underway for Ensemble Theatre Company’s new production of the 1989 Tony Award-nominated musical Starmites. With music and lyrics by Barry Keating and book by Stuart Ross and Keating, Starmites will be directed and choreographed by Steve Edlund (with co-choreographer Lili Fuller). There is one preview performance on Friday, April 23 at 8pm and opening night is set for Saturday, April 24 at 8:00. The engagement will run through Sunday, May 9. Starmites tells the zany tale of earthling Eleanor, who, dreaming her way into a comic book adventure in Innerspace, is thrust into a quest to save the galaxy. It is Eleanor, Space Punk, the Starmites and a lizard man against the evil Banshees (weird women with dangerous hair-dos) led by Diva and Shak Graa. Starmites is 100% family friendly, and will transport audiences to a whole new universe and will feature re-imagined elements, including puppets and special effects. The cast (in alphabetical order) includes Marisa Esposito, Michael Joyce, Thomas Krottinger, Matthew McFarland, Riana Nelson, Jessica Perlman, Jonah Priour, Jen Reiter, Raquel Sandler, Natalie Storrs, and Donald Webber, Jr. The set design is by Steve Edlund, costume design is by Lili Fuller, lighting design is by Phil Kong, and sound design is by Sean Kranz. The music and vocal director is Michael Alfera, puppet design is by Jessica Dalva, and Melissa Trupp serves as stage manager. The producer for Ensemble Theatre Company is Caitie Hannon. Now celebrating its 10th anniversary, Ensemble Theatre Company (ETC) was founded in 2000 by Narcissa Vanderlip and Parmer Fuller. Working with talented and dedicated young performers directed by theatre professionals, ETC has presented classic and lesser known American musicals, Shakespeare in unique outdoor settings, and original musical theatre. ETC also facilitates an annual youth community tour, bringing music, theatre and dance to child service agencies, nursing homes, and hospitals across Los Angeles County. There will be one preview performance of Starmites on Friday, April 23 at 8pm, and opening is set for Saturday, April 24 at 8pm. THE MEDIA IS ENCOURAGED TO ATTEND THE OPENING NIGHT PERFORMANCE ON SATURDAY 4/24, BUT IS ALSO WELCOME AT ANY OTHER PERFORMANCE AFTER THAT. The regular performance schedule is Thursday, Friday and Saturday at 8pm with matinees on Saturday and Sunday at 2pm through May 9 (there is no matinee on Saturday 4/24). Prices range from $10-$20 and tickets may be purchased online at www.brownpapertickets.com/event/105660. There are special family prices available for selected matinees. The Miles Memorial Playhouse is located at 1130 Lincoln Boulevard in Santa Monica.